Show my logo on the printed flipbook of mine? Scene: People always download my book, so I want to print some label to mark it which also can be an advertisement for me to popularize. Is there a function can be enabled to achieve what I need? In fact, you can complete it because FlipBook Creator for MAC has a function that make the printed file marked your brand or logo. Fortunately, people can’t find the label when view then flipbook online. That is to say, they only can view the logo after print it. 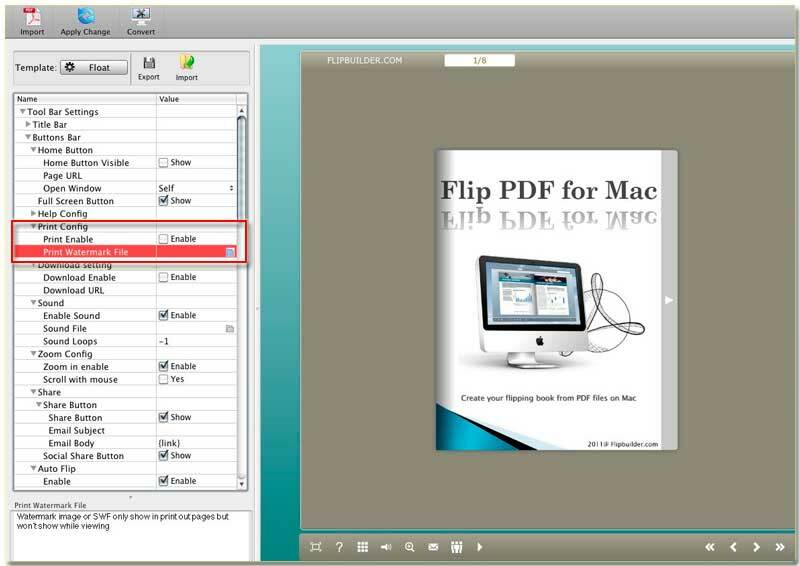 Step1: Start FlipBook Creator for MAC, and then import a PDF, next edit the PDF as a mature flipbook. Step2: Hover the mouse to the left settings area to find the options of Print Config. And then enable it and load a watermark image from local disk as the Print Watermark File. After you do all above, the printed file must have the watermark file printed on it.